For some time now we have been doing a variety of things to raise interest in Arthur Ransome and his books, particularly the ‘Swallows and Amazons’ series originally written for children. The Royal London Yacht Club recently hosted a Swallows and Amazons weekend for the combined yacht clubs of Cowes on the Isle of Wight and in doing so raised quite a bit of money for charity. Glenridding Sailing Centre in Cumbria have been running Swallows & Amazons Adventure Days on Ullswater and promise to hold more in 2015 . SailRansome have made Swallow, the original clinker built dinghy used in the film, available for families to use there. I took her out in August. We’ve been using the Draper’s shallop to teach children how to row on the River Lee under the auspices of Countryside Live. 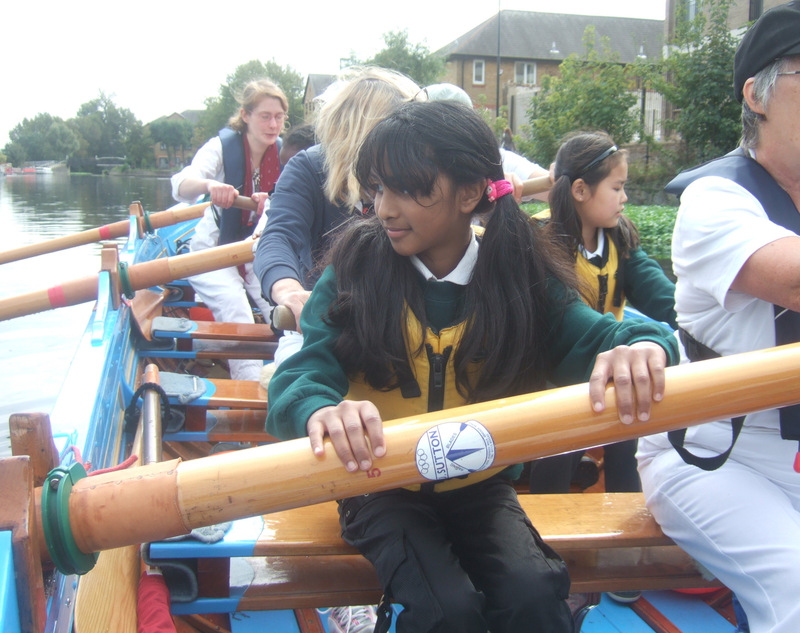 We have now taught hundreds of children most of whom have never been in a boat before. The idea is to inspire them to join the Sea Scouts or a local rowing or canoeing club. Another boat you can sail is the Nancy Blackett portrayed as Goblin from We Didn’t Mean To Go To Sea and Secret Water. It only costs £15 a year to join the Nancy Blackett Trust. This is wonderful for anyone living near the Orwell as Ransome once did. The Arthur Ransome Society, known as TARS, is welcoming new members to its six regional branches. Next year an international gathering is being planned in East Anglia over the May Bank Holiday when we hope to be able to take short trips on the wherry Albion and visit Hunter’s yard to meet Teasel, Titmouse, Dreadnaught and Death and Glory ~ the boats used in the BBC dramatisation of ‘Coot Club’ and ‘The Big Six’, when the Albion played Sir Garnet skippered by Jack Watson. 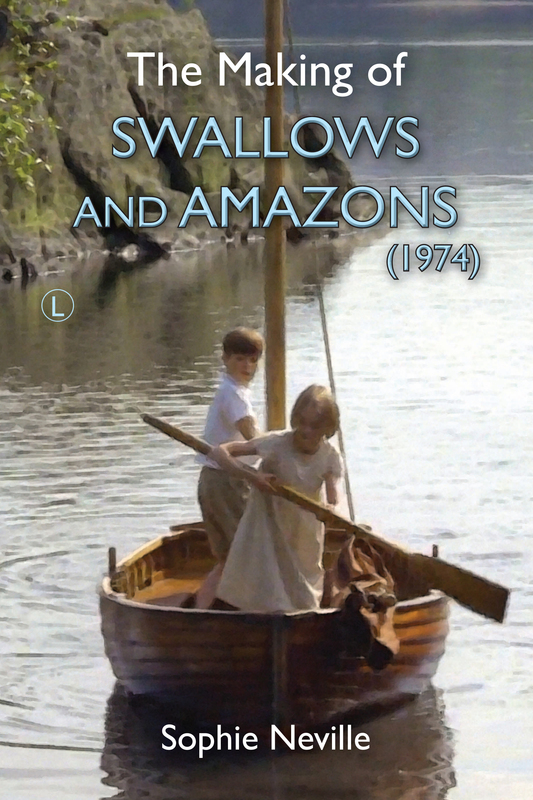 Revelation Films have digitally remastered the series, which they have available as a new release entitled ‘Swallows & Amazons Forever!’ I’ve been asked to give a talk on how the BBC serial was made. I’ve been promoting StudioCanal’s re-release of the 1974 film of Swallows & Amazons on Radio Cumbria, Premier Radio, Lakeland Radio and Channel 5’s live TV programme The Wright Stuff. There’s a lot going on in the media with recent pictorials in Country Life, The Lady and Cotswold Life magazines as well as newspapers and colour supplements. 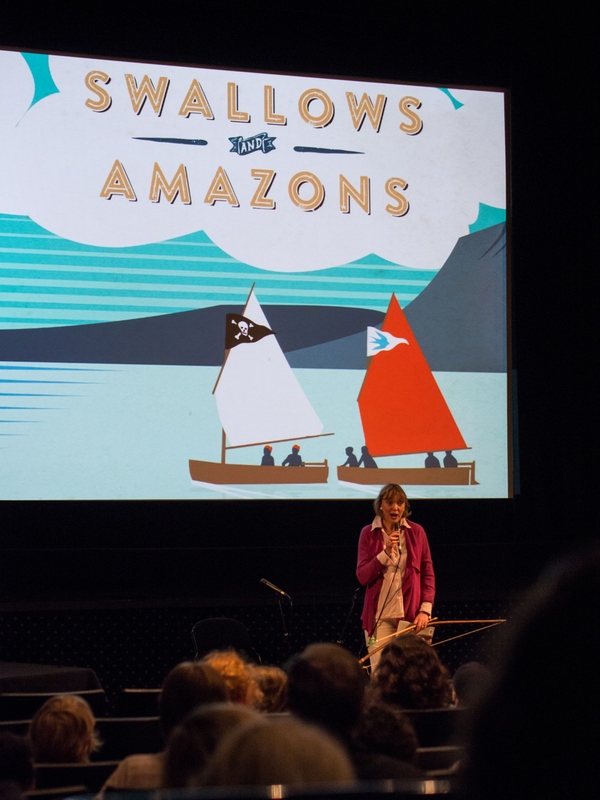 When we were in Kendal, the curator of the Museum of Lakeland Life gave a talk to the cinema audience bringing along the actual red slippers given to Arthur Ransome by the Altounyan children in 1929 which inspired him to write Swallows and Amazons. The Arthur Ransome Trust have a range of exhibitions, displays and resource materials. Do check out their website and future events. Meanwhile All Things Ransome have been quietly offering a veritable library of information along with a media vault. The Arthur Ransome Society has a large library of books in Dumfries where the 2016 IAGM will be held. What could you do to keep Ransome’s writing on book shop shelves? Could you organise an event at your local sailing club? Or request a screening of newly restored version of the film at your local cinema? One is being planned in Oxford with hopefully another at Wolverstone. PictureHouse cinemas are particularly open to the idea of screening classic family films. I am planning ‘An Arthur Ransome Day’ at my local Waterstones and another at our library. How can we make this special and attract people off the street? Do add your ideas to the comments below. Request a book or DVD from your local library. Add a review to on-line sites. This leads to increased marketing of books, audio books or DVDs. Join The Arthur Ransome Group on Facebook. They always have lively discussions. There are a number of Twitter sites you can follow. Contact BBC TV to ask for your favourite TV or radio programmes on Arthur Ransome or his books to be repeated: Click here for the site.